Two years after The Legend of Legacy, FuRyu and Cattle Call are back with another traditional JRPG, which in a way is the spiritual successor to the first game, known as The Alliance Alive exclusively on the Nintendo 3DS. Just like the first game, The Alliance Alive includes known names in the JRPG industry, such as Suikoden’s Yoshitaka Murayama, Kyoji Koizumi from the SaGa franchise and renown composer Masashi Hamauzu. 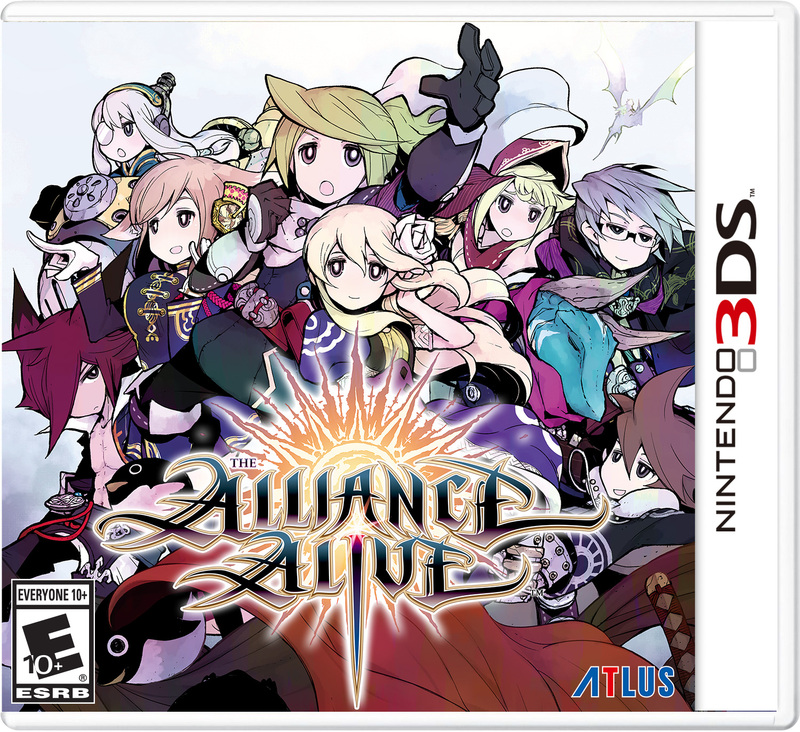 If The Alliance Alive can be considered the spiritual successor of The Legend of Legacy, it is still a standalone game and therefore not a sequel. The adventure takes place in a world taken over by the Daemons, after their invasion a thousand years before the events of the game. The world is now fragmented by the Dark Current, stuck in eternal darkness, creating 5 Realms with their individual climate and mood. Centuries later, nine individuals set their divisions aside and group up to free the world from the Daemons and their Dark Current, and this where your story starts, with Galil, a member of the Night Ravens, and his childhood friend Azura, both residents of the Rain Realm. After discovering an old painting depicting the blue sky as it was before the Daemons’ invasion, they seek to destroy the Dark Current to free and unite the inhabitants of the world different realms as it used to be. The first part of the game will, therefore, make us discover most of the protagonists via three different sets of characters. On one side, you have Galil and his friends, while on the other side of the world the Daemon Vivian and her butler are genuinely interested in helping humans. Then your last pair is Gene and Rachel, both members of the Signimancy guild. These characters will eventually meet up and form an alliance to bring down the Dark Current. But, it’s only after around fifteen hours in the game, with a dozen characters on your team and unifying all five realms, that the title really shows its potential. The Alliance Alive’s gameplay uses a very classic turn-based system, but the progression of your characters is not linked to levels of experience. In addition to winning more HP and SP from time to time after battles, the true rise in power takes shape based to the weapons that will be assigned to each of your characters ranging from sword, bow, staffs, spears and so on. To put it simply, the more you use a weapon, the more likely you are to learn new skills – known as Arts – and improve them. Magic is different, as only Daemons and Beastfolks can learn “sorcery”, and so humans will need to equip Etheract to be able to use sort of white magic skills like healing or defensive buffs. Note, however, that the learning of spells takes place mainly by buying them. In combat, each character can also reach the state of Awakening, once a special gauge is filled by using more Arts, which will activate devastating super attacks. If at first, this system leaves a certain freedom to the creation of your team and build, the game will force you to specialize and optimize certain character improvements. Because once in combat, the formation of our team will greatly influence the evolution of each character, arranged on a checkerboard of three lines, which basically defines the damage taken between each formation but also three different postures. Apart from the additional stats changes these postures bring, they are the ones that determine how your abilities will improve as well. The choice of the formation is very important so that our characters evolve according to the Positions which one has chosen for them, however, it really strengthens the tactical aspect, especially once you have to put five characters on the battleground. Because if at first, we have only pre-established training, we can later create new, much more personalized, and obtain new variants of the three postures. With the ability to switch each turn, this will allow to implement different strategies and adapt to situations. In parallel with the arts and training systems, part of the progression is articulated on the development of the guilds already mentioned, each having its specialty: Blacksmith, Signimancy, Tactic, Recon and the Library. These will then provide us with several opportunities for your members to help them and at the same time grow and get more support. To do this, their development will go through two different stages: on one hand, we can build towers on some key points of the world and offer each of them to a guild, and on the other hand, you can also recruit various NPCs and assign them to support those towers. In doing so, guilds will gain in levels and bring us a whole lot of supporting elements. These bonuses range from new equipment as you level the Blacksmith guild, new spells for the Signimancy guild or new fighting postures with the Tactic guild as an example. When it comes to technicality and graphics, The Alliance Alive is a fairly good game, especially given the fact that it’s only on the Nintendo 3DS. The level-design levels and dungeons are rather simple but remain varied enough to avoid a sense of deja-vu, including some effective puzzle sequence. The exploration on the map has a free camera with decent viewing distance, and the characters are adorable Chibi-style designs. With its colorful tones, the overall game is pleasant to watch and the design of some villages and towns sometimes look like watercolor paintings. Last but not least, the music is composed by Masashi Hamauzu, which, although some tunes are more effective than others, the soundtrack stands out. The Alliance Alive was reviewed using a Nintendo 3DS digital download code of the game provided by Atlus. We don’t discuss review scores with publishers or developers prior to the review being published (click here for more information about our review policy). A solid JRPG experience by FuRyu, The Alliance Alive is a reminder that the Nintendo 3DS still has lots to offer as a platform even after the Nintendo Switch launch. Although the game is very traditional in its mechanics, it's still fun to play with an efficient and rewarding progression system.